When I was called to be Relief Society president in our ward, I felt very strongly that we should visit every sister on our ward lists on their birthday. Two plus years into it, we’ve had great success in getting to know the ladies of our ward with these simple front door drop bys. My presidency and and I rotate months, so we each do visits once a quarter. We always bring a little gift with us. I’m going on my third year, so here are the three gifts we’ve done so far, all under a dollar and all using coupons from Joanns, Michaels, and Hobby Lobby for all purchases. We have a bout 150 ladies on our roster, so at the beginning of the year, we just make all 150 and then they are all ready to go each month. The first year we did these “love blocks”. They are the most labor intensive, but also the cheapest (about 35 cents each). The wood is 2x4s cut into blocks painted various colors (seasonal) with a Silouette or Cricut paper cut out “love” modge podged on (layer over the top too). On the back is a little note with a signature from each of us. Finish with a tulle bow, and you’ve got a “gift of love”. The next year we did these little flower vases. We got the bottles from a local bottle distributer, filled with sand and got various flowers (again, seasonal) from the craft store. Currently we are delivering these little book marks made out of a large vintage-looking clip and clay flowers, both from Pick Your Plum. The flowers I purchased were a variety pack, so I used the big ones for this project and the small ones for this project. This is just printed on 4×6 photo paper with a slit cut with a razor blade to attached the clip. All wrapped up: Clip up close: We’ve also given out the adorible note pads that JB Designs has on her site for a little over a dollar. We gave them out at our Christmas program, but they would work for birthday visits for sure. Do you do birthday visits? I would love to hear what you bring along! I really love these! I’ve been looking for something cute, fun and cheap to use for birthday gifts this year. I’ll probably go with the paperclip idea because it looks like something I could keep up all year! Thanks for sharing! Where did you find the backing for the paper clip to hold the paper clip in place? Hi there, If I understand your question correctly, you mean the little circle on the back of the clip? They came that way, I just glued on the flower. Hope that helps. I would love to have you make some bookmarks for us but the budget won’t allow it. Can you tell me where I can purchase the paper clip? I bought mine on pickyourplum.com but they are a “deal a day” sight. You could use regular jumbo paper clips instead. 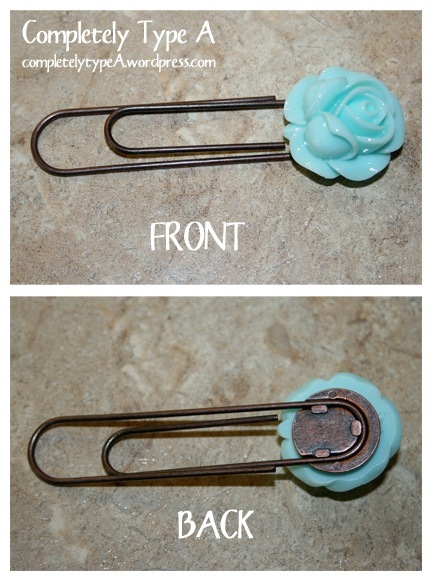 I love the paper clip/flower bookmarks! Do you remember about how much they each cost? I’m looking for birthday gift ideas for next year. 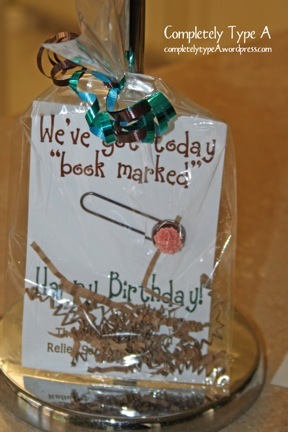 We also make personal visits (or try to) and leave a little gift with them. Thanks! Hi Karen, they were around 50 cents each, but I don’t remember exactly. You might want to try Etsy. Good luck!